Order a qualifying offer. Still need to place your order? Submit your online redemption form by the deadline. Your Visa prepaid card will be mailed to the address provided in your redemption form after your account has been activated and in good standing for 90 days. Get the best price on all TV + Internet + Phone packages. Filter to find the best cable and internet deals, including Home Security. *Note: Most promotional prices cannot be combined with promotional prices for other services. The regular rate for this service may apply if another promotional service is added to your cart. Offer expires 07/01/2019 and is available to new residential customers in Cox service areas. Offer is only available for new subscriptions to Cox Contour TV Ultimate with HBO®, Cinemax®, Showtime®, and Starz®, Gigablast Internet service, and Digital Telephone Premier. Bundle rate increases $20/month for months 13-24. After promotion period, regular rates apply. Prices exclude additional equipment charges, inside wiring fees, additional outlets, taxes, surcharges (including video Broadcast Surcharge ($10.00/mo.) and Regional Sports Surcharge ($9.00/mo., depending on Cox market)) and other fees. Not all services and features available everywhere. A credit check and/or deposit may be required. Offer not combinable with other product offers. Online orders only. Other restrictions may apply. *Note: Most promotional prices cannot be combined with promotional prices for other services. The regular rate for this service may apply if another promotional service is added to your cart. Offer expires 07/01/2019 and is available to new residential customers in Cox service areas. Offer is only available for new subscriptions to Cox Contour TV Ultimate and Internet Ultimate service. Bundle rate increases $20/month for months 13-24. Equipment fees extra. After promotion period, regular rates apply. Prices exclude installation/activation fees, equipment charges, inside wiring fees, add'l outlets, taxes, surcharges and other fees. Not all services and features available everywhere. A credit check and/or deposit may be required. Offer not combinable with other product offers. Online orders only. Other restrictions may apply. The website is asking me for a 5-Digit Offer ID. Where do I find the Offer ID? The offer ID is listed on the email that you received or was presented by the Cox representative at the time your order was placed. Please contact Cox Communications at 1 844-205-1021 if you are unable to locate your Offer ID. What date do I enter for the Install Date? Your Install Date is your first Billing Period date. If your Billing Period shows Apr 04, 2018-May then you will enter 4/4/2018. Where do I locate my account number? 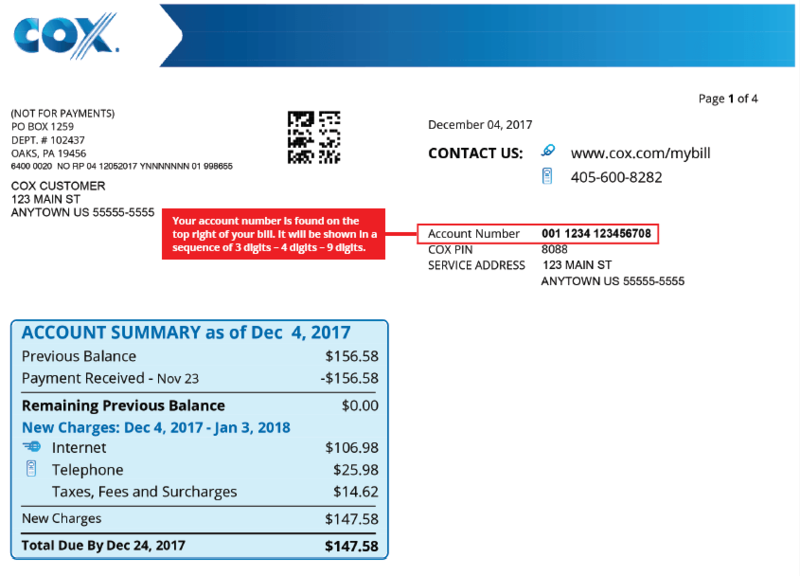 You can locate your 16 digit Cox Account Number on your billing statement. 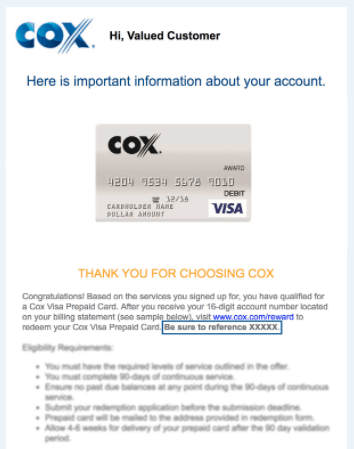 Or, you can sign into your Cox Account by clicking here. Your account number is found on the top right of your bill. It will be shown in a sequence of 3 digits – 4 digits – 9 digits. When submitting online, do not submit with dashes or spaces. Can I have my card mailed to a PO Box? Post office boxes are not valid street addresses and are not accepted. Incomplete or illegible claims will not be processed. Your prepaid card will be mailed to the address provided in the redemption form. Please allow 4-6 weeks for delivery of your prepaid card after the 90 day validation period. What type of card will I receive? 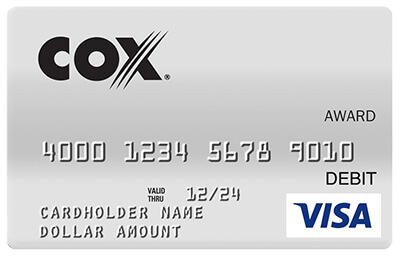 You will receive a Cox Visa® Prepaid Card. This Card, however, does not have ATM or cash access. PIN available, NOT REQUIRED. Can I use my card as payment for my Cox bill? Yes, you can use your prepaid card to pay for your bill online or by phone. Where do I find more information about my card? For more information about your card, click here and have your card number on hand. Cox Visa prepaid card offer available to residential customers subscribing to select Cox products or bundles through 12/03/18 in Cox service areas. Online only. Cannot be combined with any other online offers. To redeem, visit www.coxreward.com by the submission deadline with your Cox account number and complete the online redemption form. Forms must be submitted online by the submission deadline. Post office boxes are not valid street addresses and are not accepted. Incomplete or illegible claims will not be processed. Limit one offer per household. Your Cox Visa prepaid card will be sent to the address submitted on your redemption form after your account has been active and in good standing for a minimum of 90 days. Please allow 4-6 weeks for delivery of your Cox Visa prepaid card after the 90-day validation period. For questions regarding the status of your Cox Visa prepaid card request, call 1-844-205-1021 or visit www.coxreward.com. Cox Visa prepaid card is issued by MetaBank®, Member FDIC, pursuant to a license from Visa® U.S.A. Inc. No cash access or recurring payments. Can be used everywhere Visa® debit cards are accepted. Card valid for up to 6 months; unused funds will forfeit after the valid thru date. Card terms and conditions apply. Other restrictions may apply.